Whether you're shopping for your first sofa or looking for an affordable replacement as part of a living room redesign, there are plenty of stylish sofas designed to suit budgets of less than £500, without compromising on quality. Once you've decided what kind of sofa might suit your space – our guide to choosing a sofa can help with that – browse our pick of the best sofas under £500 and transform your space. Find the latest cheap sofa deals in our monthly update, too. Perfect for those who enjoy a little more luxury in their life, the Margot Two Seater Sofa from Made makes a stylish and statement addition to a scheme that requires a touch of glamour, and all for less than £500. Available in inky greys and greens, as well as standout pinks and mustard shades, there's a finish to suit every taste and space. Designed with compact spaces in mind, the Archie II Small Two Seater Sofa from John Lewis & Partners is small, but mighty. With hundreds of fabric finishes to choose from, it's never been easier (or more affordable) to custom design a sofa that suits your space without compromise. What we love most about this sofa is its quality; a 10 year frame guarantee places this small and budget friendly option in line with more expensive options from both John Lewis & Partners, as well as their competitors. The clean lines and a simple design of this John Lewis & Partners Jackson Small Two Seater Sofa make for a sofa with an attractive finish, while foam and fibre cushions to provide a good level of support. Thanks to its birch wood legs, the encompassing style is minimalist and neutral, making it a great addition to the majority of lounge set ups. While it’s not the kind of two seater sofa you would snuggle down and watch a film on, for a splash of colour in a bright, modern setup the Moby Sofa from Made is certainly one to consider. As the smallest sofa on our list, it makes a stylish addition to a large room or a striking focal point in a smaller space. With different finishes on offer – everything from blush pink velvet to a moody forest green – the finer details have been considered to deliver a carefully considered, sculpted sofa. 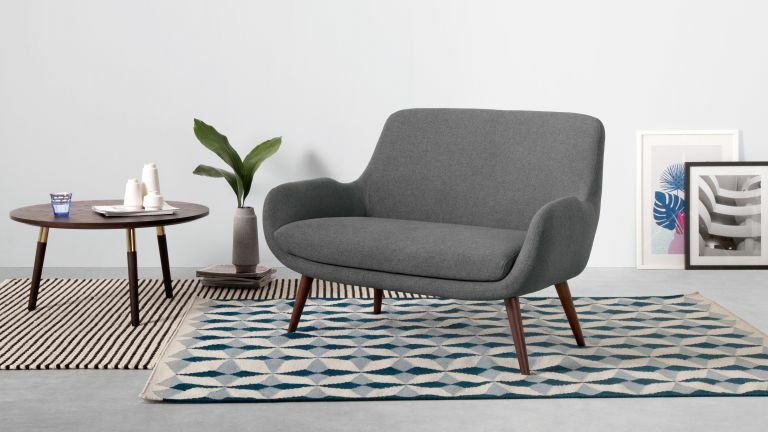 If maximising space (as well as your budget) is top of your list of priorities, this gorgeous Chou Sofa Bed from Made makes a great choice for either the lounge or your spare bedroom. The fold mechanism is easy to operate, providing enough room for two guests to sleep once laid flat, or for three to sit comfortably when upright. Available in beige, grey and two shades of blue, there's a shade to suit every space. As if all of this wasn't enough, it even comes with ample space for storing pillows and other bedding. With a plush cushioned back and flared arms, this modern Arlo Small Two Seater Sofa from John Lewis & Partners is designed with comfort in mind. Available in a huge variety of colours, this sofa can be expected to fit in perfectly with any interior design scheme. Bespoke sofa? This is the closest you'll come for less than £500. Bargain. Looking for more sofa inspiration?